We're all familiar with the conventional wisdom that at halftime of a championship sporting event, the local water system is strained by fans' long-postponed evacuations of a beer or three. Well, after full time of a major fixture, FIFA's Internet pipe is likewise overflowing with teeth-gritting angst and cathartic release, too. Probably the best example came this May, in the mindbending conclusion to the English Premier League campaign. Manchester City, long the stepbrother to the more glamorous Manchester United, captured its first English championship in a generation after scoring two goals past the 90th minute against a Queens Park Rangers side fighting to avoid relegation. City and QPR were hardly the only clubs with so much on the line that day: United (second place on goal differential), Arsenal, Tottenham Hotspur, and every side facing relegation had a single game that would determine success or failure for an entire year. And when it was all over, happy or sad, exultant or despondent, these fans flooded EA Sports' servers. 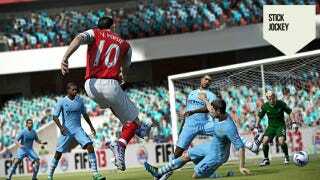 FIFA is easily the world's biggest selling sports video game and its one-year-old Football Club online community numbers more than 9 million. After the EPL final, the game's managers counted more than 5 million attempts to recreate City's two-goal comeback in stoppage time. And that's not including the assuredly millions of counter-attempts by dejected United supporters to overturn history, if only in their own living rooms. It underlines something every sports video game fan knows to be true: Half of the fun, yes, is fantasizing how you would perform as an elite professional, or the choices you would make as a manager, in either a long slog to glory or a single elimination game. The other is in reliving the emotions of the day. "We know when big games happen in the world, people go online and they want to relive that game," said Matt Bilbey, the EA Sports vice president of football who is in charge of the FIFA series. "So if they're a Man City fan—or even if they're a Manchester United fan, and want to play as QPR to beat Man City—the world connected online in FIFA and replayed that match." That's one reason why on stage at E3, Bilbey described FIFA, with some justification, as the "social network of sport." For 90 minutes on the day of a match, diehard football fans are connected to their club through its event that day. "Outside of that 90 minutes, the emotional connection is through our game," Bilbey said. "They go online to be a representative part of that team on a daily basis." It's not a phenomenon limited just to football. In American football, telemetry has shown Madden usage spiking at halftime even during opening-week matches, when the game's usually been out for a month. MLB 2K's "MLB Today" mode was specifically meant to service this concept, the same as The Jordan Challenge of NBA 2K11, which allowed gamers to recreate 10 feats of basketball's greatest superstar. Even NBA Live 10 allowed players to pick any game out of the preceding season, including the playoffs, and redo or undo history. If anything, Bilbey's boast about FIFA driving sports fans' emotional connections is too modest. Sports video games, and the knowledge they impart of the game and its performers, are increasingly the way in which fans can relate to or deal with all real-world outcomes in sport, historic and current, outside of being in the stadium to see it unfold live. That's where Bilbey, an Englishman and devoted Tottenham fan, found himself for the torturous end to his club's season. Spurs were not on the pitch in Munich for the Champions League final, but Bilbey still had plenty of interest in the outcome between Chelsea and Bayern Munich. Tottenham had finished fourth in the Premier League, provisionally qualifying for 2013's Champions League, the elite tournament of club football. Still, they were threatened by sixth-place Chelsea, who would take Tottenham's place with victory, as a Champions League winner has the right of defending its title. "I went to the Bayern Munich game with Colin (Macrae, FIFA's spokesman) and [David] Rutter [the game's executive producer], and I was supporting red, supporting Munich," Bilbey said. "In the 89th minute, I was kind of celebrating, and then Drogba did what he did, and then it all went downhill." Didier Drogba equalized late for Chelsea, then scored the winning penalty kick after extra time, booting Bilbey's Spurs out of the 2012-2013 Champions League in the bitterest fashion. "Chelsea to be honest were terrible, except when they played those games," Bilbey said. "And to be honest, they played not to lose, rather than to win. All credit to them, they managed to push through and they won it." Sitting in the stands, thousands of miles from his console and his controller, FIFA's boss had to do what no FIFA gamer in his home has to tolerate. He had to sit there and take it.